We are an approved alternative education provider for Nottinghamshire County, Nottingham City, Leicester City and Leicestershire County Councils. We also work with individual schools and with children who are home schooled. We cater for individuals of all abilities from those with learning difficulties to those who are exceptionally able. Equine Assisted Learning is an experiential way of learning that suits many learners who find formal schooling challenging. Learning is tailored to the needs of the individual and our key strengths are supporting children with complex autism that includes emotional support needs and those with attachment difficulties and issues related to trauma. As an approved EAQ centre (http://www.equineassistedqualifications.com/) we are able to offer nationally recognised qualifications through the Open College Network. These include awards related to employability, personal development, literacy and numeracy, as well as specific animal care awards. Click here to see the qualifications we offer. We also run bespoke 6 to 12 week courses for groups that can cover issues such as communication, assertiveness and decision-making, developing self-confidence, social skills, self-confidence and issues related to bullying. These are based on activities that include observation and discussion of horse behaviour and interaction in a natural herd environment. 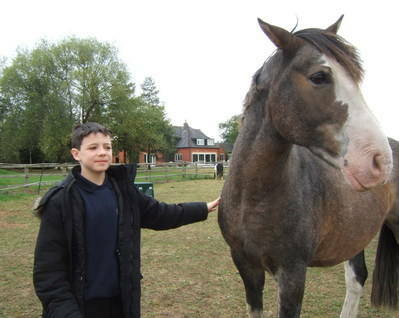 For long term learners we are able to cover all curriculum areas through activities based around the horse. Some of the activities we have covered have been measuring and plotting graphs of seasonal changes in horses' weight; researching the use of horses in war through history as part of a project on the book War Horse by Michael Morpurgo; comparing what makes up a healthy diet for different animal species and humans; and a mouse breeding project to learn about genetics.